A is for Asparagus Benedict | WTF Do I Eat Tonight? I’m not sure there is any moment of the year, in food terms, that rivals the beginning of May. At least not in Britain. Because this is the time of year when British produce comes into its own: suddenly it’s possible to eat new potatoes from Jersey, strawberries from Kent and asparagus from Worcestershire. My grandparents used to grow all three in their garden and allotment and, although I knew all about Jersey Royals and strawberries when I was younger, I didn’t discover asparagus until I was an adult. And, oh my, now I’m addicted. So, when May comes around, I buy more of it than any other vegetable and, since the season only lasts for six weeks, I’m always looking for ideas for cooking it. For a ten-minute dinner I steam a bunch for 3-5 minutes (the time required will depend on how fresh it is) then smother the spears in melted butter, sea salt and black pepper. All I need with it is some fresh bread to mop up the juice and butter. For something a tiny bit more complicated (really tiny), asparagus, like purple sprouting broccoli, is gorgeous with eggs (poached, fried or mix some pre-cooked spears into scrambled eggs), olive oil and Parmesan (steam the spears as above, and serve with olive oil instead of butter and slivers of the cheese) and good ham or bacon (steam as before and wrap in the ham to serve, or serve with cubes of crispy bacon and olive oil). Today I decided to try using it in one of my favourite dishes: eggs Benedict. Since asparagus goes well with all its components (ham, hollandaise, sauce, eggs, bread) I thought I’d try asparagus Benedict. And it works; it’s a bit heavy on the pans (you’ll need three) but light on time and ingredients. I’m definitely not saving this just for breakfast. 2. 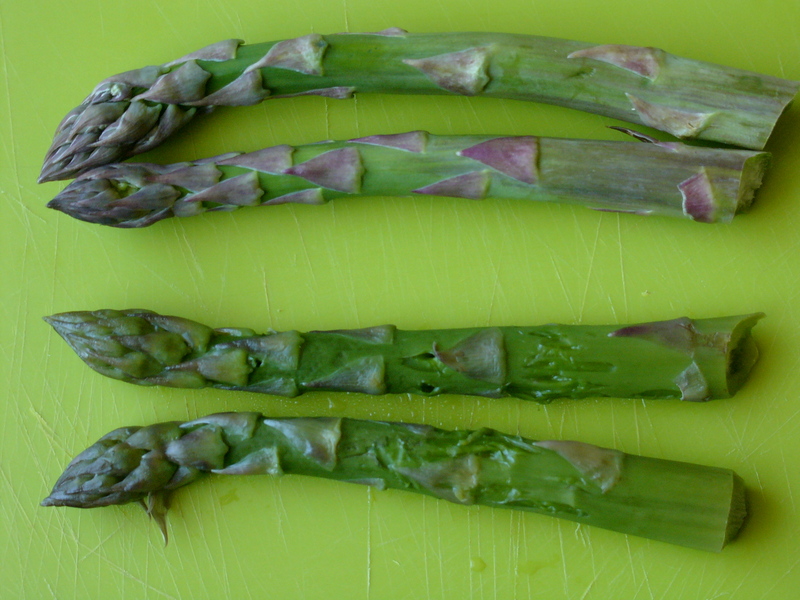 Steam the asparagus for about 3-5 minutes until a fork goes easily into both stem and tip. Drain it and keep it warm (the pan it was steamed in should have enough residual heat to do this). 3. 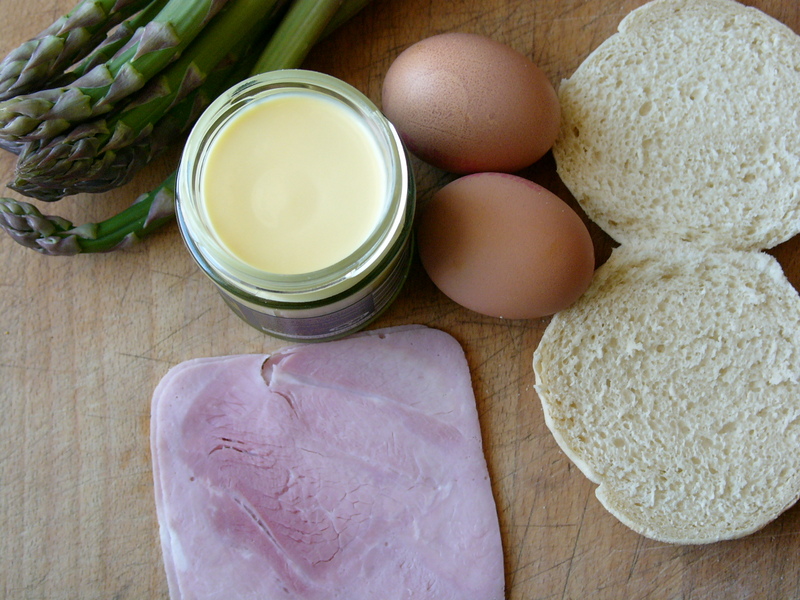 About halfway through the asparagus’ cooking time, split and toast the muffins, butter or oil them then lay a slice of ham on each side. 4. Then start heating a little oil in a frying pan and fry the eggs (or poach them if you prefer). At the same time put the hollandaise in a small pan over a low heat to warm through (you can heat it in a microwave too but, since I don’t have one, you’ll have to follow the jar’s instructions for that). 5. 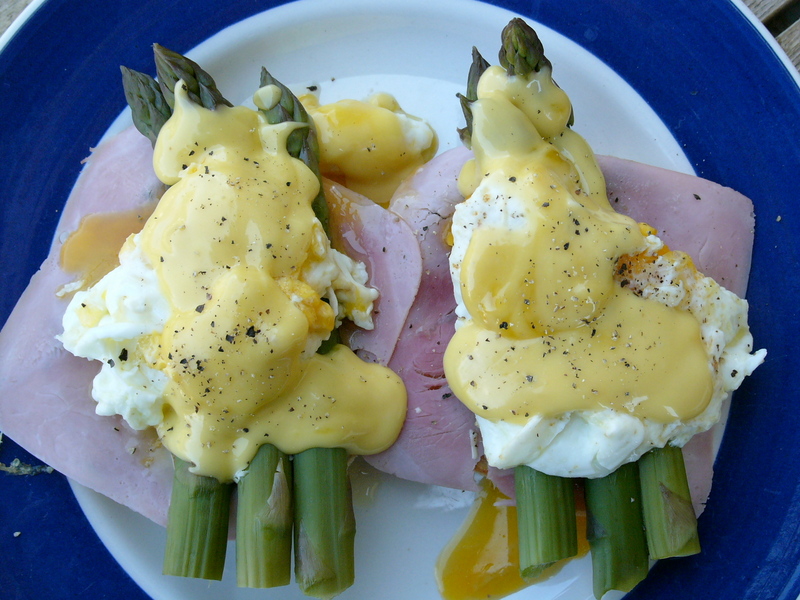 When the eggs are done and the hollandaise is warm, place the asparagus spears on the ham, put the eggs on top and finish with the hollandaise. Season with salt and pepper and devour. This entry was posted in Asparagus recipes, Spring vegetable recipes, Summer recipes and tagged asparagus, asparagus Benedict, eggs Benedict recipe, fast asparagus recipes, fast recipe ideas. Bookmark the permalink. There just aren’t enough days in the month…this is a great way to eat it for breakfast as well as every other meal!